Generals often change the outcome of battles whether combating personally or dispensing orders from aside. 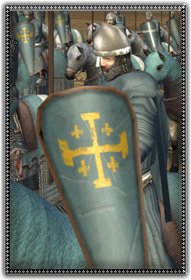 As the majority of the generals of Jerusalem have come from their homes half a world away to embark on this glorious Crusade, they want to make sure they are well protected. This is why only a select few of elite crusader knights have been chosen to guard this commander. Armed with a lance and straight sword for close combat, they will achieve much glory aside your general or defend him to the bitter end.